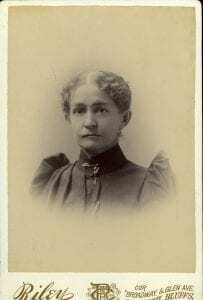 Lydia B. Allen Atkins was born July 10, 1843 in Pennsylvania to Henry and Susan Allen (read about Henry Allen here). Lydia arrived in Council Bluffs with her family in 1854 and a few years later was heading west. Also heading west was John B. Atkins. I like to think that Lydia and John were courting on their way west, but they definitely got to know one another, as they were married in Arapahoe County, Colorado on October 16, 1859. As noted in our post about John B Atkins, the couple spent years in Colorado and New Mexico before heading back to Council Bluffs in 1866. They had two children, Henry and Mollie. Lydia and John set up house at 540 6th Avenue. Their son Henry lived with them and worked with his father. The daughter Mollie married Dr. Thomas B. Lacey in 1878. Two years later they had a son, Thomas jr.
Lydia took her place in Council Bluffs as a “dictator of society”. Every week she was hosting visitors and guests in her home. She was active in the Episcopal church, Order of the Eastern Star, the Woman’s Christian Association and many committees. Lydia was also an avid traveler, traveling with her son or grandson. Some of her destinations were New Orleans, Los Angeles, Seattle and frequent trips east. John B. Atkins passed away in 1903 and Dr. Thomas B. Lacey died in 1907. Lydia maintained her home and place in society until 1926, when the home at 540 6th Avenue closed. The furniture of the home was the marvel and envy of all those fortunate enough to enjoy the Atkins hospitality. Much of it came from the Japanese exhibition at the Jamestown, Va., exposition, purchased by Henry Atkins and Dr. Tom Lacey, now of Glenwood, grandson of Mrs. Atkins. Huge mirrors, elaborately carved chairs, tables and desks, oriental rugs, original Charles Dana Gibson paintings, great leather divans and tapestries were among the luxuries collected by the Atkins family. The library was furnished as a reproduction of that of Dr. Lacey’s fraternity house at Cornell university, New York, and the dining room was like that of the Plaza hotel at New York city. Lydia Atkins died September 9, 1927 and is buried in Fairview cemetery. There is one mystery in this story. Mollie Atkins. As noted Mollie married Thomas Lacey in 1878 and in 1880 they had a son Thomas jr. The last mention of Mollie in the society pages was May of 1881. In the 1900 census Thomas is listed as a widower. Try as I might, I could not find an obituary for Mollie and she is not buried with the rest of the family in Fairview Cemetery. Nor is she mentioned in any of the obituaries of her family.